You are what you eat. 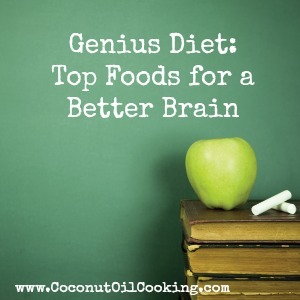 The best foods for better memory and stronger brain. I’m always amazed at how intertwined our diet is to our overall health and wellbeing. Growing up, I wasn’t too aware of the types of food I was putting in my body. It never occurred to me what I ate would impact my skin, much less my brain. But it’s true, more and more research is making the connection between certain foods and the ability to strengthen the brain. Right now, the Byrd Alzheimer’s Institute is studying if the ketones created by coconut oil can help fuel the brain when it stops processing glucose, as in the case with Alzheimer’s. 1. Shield Brain Cells – Antioxidants have been found to clear your cells of “free radicals” which, over time, can break down cells. Paula Bickford, Ph.D., professor of neurosurgery at University of South Florida, says antioxidants’ main job is to protect our cells’ internal energy source – the mitochondria. Research shows free radicals can damage the brain. So what’s the way to prevent this? The top foods include apples, citrus fruits, sweet potatoes and kale. These are power-packed with flavonoids and/or carotenoids, both have been found to slow down cognitive decline. 2. Beat Back Inflammation – Inflammation in the body has been tied to a lot of diseases, including Alzheimer’s and Parkinson’s. Eating foods with a high dose of curcumin and catechins have been found to decrease inflammation in cells. In fact, researchers believe the high amount of curry-based foods in India has some tie to the country’s low Alzheimer’s rates. Eating more curry-based dishes are a good start, but you can also eat strawberries and drink green or black teas for other sources. 3. Boost Blood Flow – Just like any other part of your body, your brain needs blood to work. Some studies have suggested increasing blood flow may help learning capabilities, memory and even reaction time. Foods packed with resveratrol may be able to boost blood supply to the brain up to 30 percent. In moderation, red wine is a good source. 4. Spark New Neurons – Neurologist Majid Fotuhi, M.D., Ph.D., says certain proteins can help rejuvenate the brain by creating more neurons. While it’s still unclear WHY, Dr. Fotuhi says it looks similarly to a drub currently used in Alzheimer’s patients by prohibiting the breakdown of neurotransmitters. Filling your plate with egg yolks (that’s right, the yellow stuff), chicken, blackberries and plums can help increase this protein in your body.